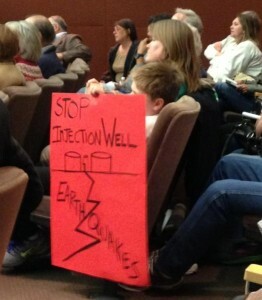 On Tuesday January 21st, North Texans organized another meeting in front of state regulators demanding a moratorium on hydraulic fracturing disposal wells until they got answers about the recent earthquakes. Residents of various ages and backgrounds came to speak about the integrity of oil and gas wells, property values, the need for stronger regulations on injection wells, pollution in water resources, and ways to pay for damages. Chairman Smitherman said that an injection well moratorium is not within the Commission’s authority, but that they can take action on individual permits. In order for these disposal wells to be shut down as requested, the companies would have to violate their permits from the Commission, but with permits continuing to leave out regulation for seismic activity we have to wait and see what the subcommittee on seismic activity can accomplish. Click here for more information from Sierra Club’s Texas Green Report.